GUJCET Answer Key 2018: Gujarat Common Entrance Test has successfully conducted by GSEB on 23rd April. Many of the hopefuls have competed for GUJCET examination this year. The Gujarat Board of Secondary Education has conducted the GUJCET examination across the state of Gujarat. Nearly 2 lakh above aspirants have competed for the GUJCET examination this year. The competitors who are anxious about their attempt can cross-check their answers by downloading GUJCET answer key [official]. The Gujarat BSE is going to upload the GUJCET question paper solutions for all sets A, B, C, D. Competitors can download GUJCET answer sheet PDF for the corresponding set and can tally with the answers given in it. Candidates can go through the following article to check more details about GUJCET answer key PDF. Gujarat Common Entrance Test is shortly known as GUJCET. This examination is performed by Gujarat Secondary Education Board (GSEB) annually for aspirants seeking to get admittion in various courses. Applicants who need to do medical choices like MBBS, BDS, Physiotherapy, Ayurveda, Homeopathy, Nursing, Optometry, etc and students seeking admission in Engineering courses will apply for the GUJCET entrance test annually. Based on the rank scored by the aspirants they will be given admission to various courses. Every year lakhs of hopefuls apply for GUJCET examination. More than 2 lakh aspirants have applied for the GUJCET examination this year. As per the reports, almost all the hopefuls applied for the GSEB GUJCET examination have appeared for the test on 23rd April. This examination has been conducted in a large number of examination centers across the state. All the hopefuls appeared for the GUJCET examination can download GUJCET answer sheet PDF from the official portal, gujcet.gseb.org. Candidates can download the answer key approximately after 3 to 4 days of the examination date. Candidates can download the answer key for all sets A, B, C, D. Download the answer key for relevant set and compare the answers to estimate the score. Candidates can clearly analyse their attempt by comparing with the GUJCET Answer key. Competitors who cannot wait for official answer key can get the unofficial answer key from various sources. The coaching institutes offering the GUJCET training will release the answer keys soon after the examination. Candidates can go with the unofficial answer keys meanwhile the official answer key is released by GSEB. Here we have given the downloading process to access the answer key. Just follow the steps to easily download GUJCET answer key. On the homepage, the competitors can find the answer key link on the homepage. Click on it and provide the necessary details. 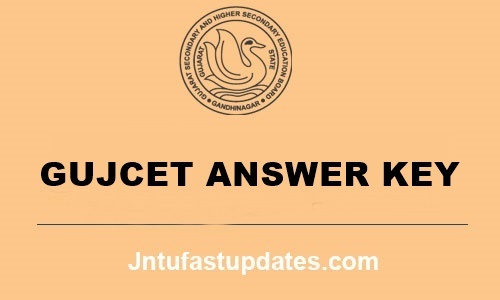 The GUJCET answer sheet/question paper solutions will be downloaded in PDF format; which contains the answers for all sets A, B, C, D.
Compare with the corresponding set and estimate the probable score in the examination. Take a printout of it if needed for further reference.